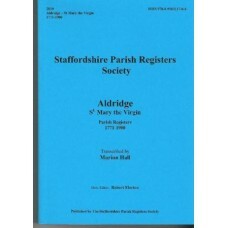 Aldridge St. Mary the Virgin Parish Register transcripts 1771-1900 Also available as a downloadable pdf file Published by the Staffordsh..
Alrewas Staffordshire Parish Registers Part 1 Baptisms, Marriages & Burials 1547-1670 Also available as a downloadable pdf ..
Bramshall St. Lawrence, Parish Registers 1587-1900 Also available as a downloadable pdf file Published by the Staffordshire Parish Regi..
Broome, Staffordshire Parish Registers Bishop's Transcripts 1613 - 65, 1758 - 84 Baptisms & Burials 1664 -1850 Marriages 1664-1850 ..
St. Edmund Dudley Staffordshire Parish Registers Baptisms, Marriages & Burials 1540-1646 Also available as a downloadable pdf f..
Fulford, St. Nicholas Parish Registers Baptisms 1813-1837, Marriages 1800-1837, Burials 1815-1837 Also available as a downloadable pdf&n..
Gratwich St. Mary Staffordshire Bishop's transcripts 1680-1812 Parish Registers Baptisms 1813-1900 Marriages 1755-1811, 1813-1834, 1837-19..
Kingstone St. John the Baptist Parish register transcripts Baptisms 1679-1873 Marriages 1689-1837 Burials 1679-1868 Also available as a..
Kinver St. Peter Part 1 Parish Registers Baptisms & Burials 1560-1775, Marriages 1560-1754 Also available as a downloadable pdf file..
Kinver St. Peter Part 2 Parish Register transcripts Baptisms & Burials 1776-1839, Marriages 1754-1837 Also available as a downloadable pd..
Leigh All Saints Staffordshire Parish Register transcripts 1541-1837 Also available as a downloadable pdf file Published by the Stafford..
Maer St. Peter Staffordshire Parish Registers 1558-1746 Also available as a downloadable pdf file Book format Published by the Staffo..
Mavesyn Ridware, St. Nicholas Parish Registers Baptisms, Marriages and Burials 1538-1812 Also available as a downloadable pdf file Pu..
Pattingham, St. Chad Parish register transcripts Special bulk buy Part 1. 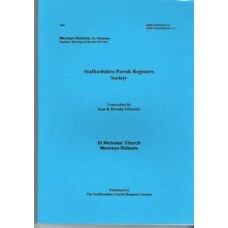 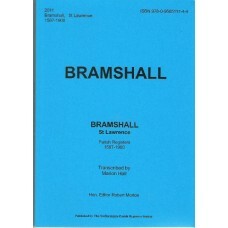 Baptisms, Marriages & Burials 1559 -1812 Part 2. 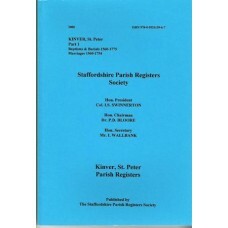 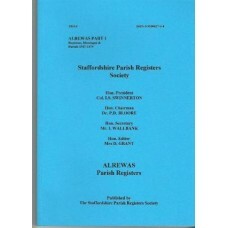 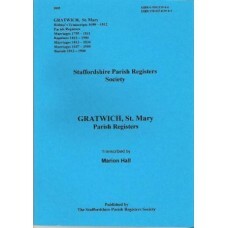 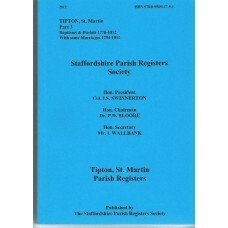 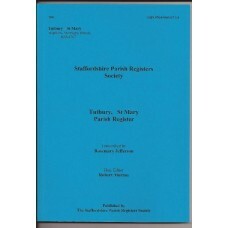 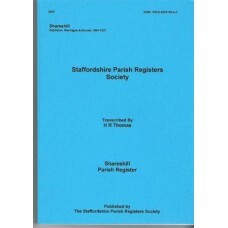 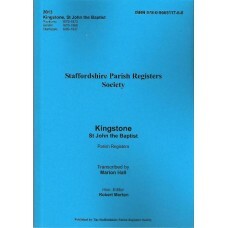 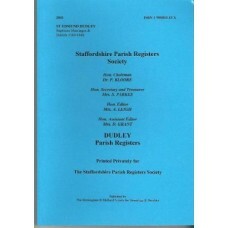 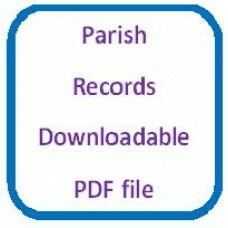 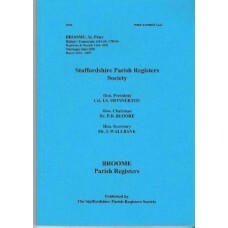 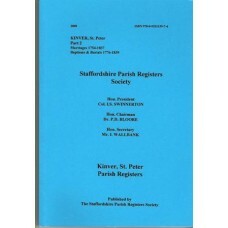 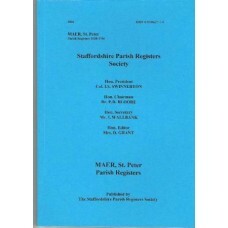 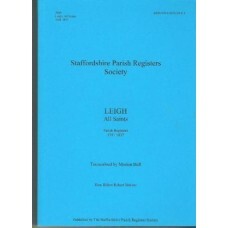 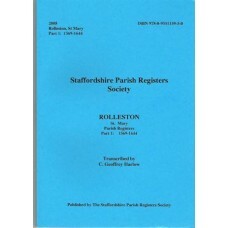 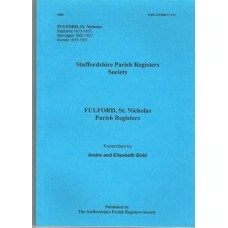 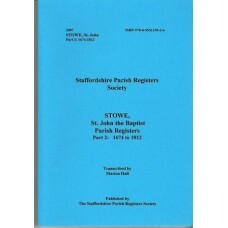 Baptisms 18..
Rolleston St. Mary Parish Registers Part 1 1569-1644 Also available as a downloadable pdf file Published by the Staffordshire Parish..
Rugeley, St. Augustine of Canterbury Parish Registers Part 2 Baptisms 1722-1849 Marriages 1722-1847 Burials 1722-1841 Book format, 400 ..
Shareshill Parish Registers Baptisms, Marriages and Burials 1564-1837 Also available as a downloadable pdf file Published by the Staf..
Stowe, St. John Parish Registers - Part 2 Baptisms, Marriages & Burials 1674-1812 Also available as a downloadable pdf file ..
Tipton St.Martin Part 3 Baptisms and Burials 1770-1812, some Marriages 1754-1812 Parish Registers Also available as a downloadable pdf&n..
Tutbury, St. Mary Baptisms, Marriages & Burials 1688 - 1767 Parish Registers Also available as a downloadable pdf file Published ..